Pronghorns are a North American ungulate (hoofed animal) that calls Big Sky Country home. 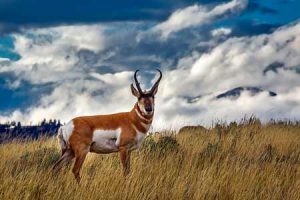 While you might not see these creatures directly in Big Sky, they are a common sight in the wide open and expansive fields, grasslands, and rolling sage brush in the region - especially in Yellowstone National Park and along I-90. Pronghorns are often referred to as antelope. They earned this description back in 1804-1806 when Lewis & Clark journeyed across North America. While antelope do appear similar to pronghorn, technically antelopes are animals that are native to Africa and Eurasia - not North America. The scientific name for a pronghorn is Antilocapra americana. It is the only surviving member of the Antilocapridae family. Pronghorns are often called prongbuck, pronghorned antelope, or American antelope. Males are called bucks. Females are called does. Babies are called fawns. Pronghorns are tan in color with white markings on their underside and rump. Bucks also have black face and neck markings. Pronghorns are about 4 to 5 feet from nose to tail and stand about 3.5 feet high at the shoulder. They weight between 85 and 145 pounds. Males are usually 10% bigger than females. Their body temperature runs at approximately 100 degrees F.
Pronghorns are the fastest land mammal in North America. Their average running speed is 40 MPH, but they can run at speeds of up 60 MPH for long distances. Pronghorns have 13 distinct gaits - one reaches up to 20 feet per stride. To protect themselves when running over uneven or firm ground, they have pointed and padded double hooves. Pronghorns got their name from the horns that point backwards toward their rump and then prong. Both sexes have horns, but the buck's horns are longer and measure 12 to 16 inches. The horns fall off annually usually shortly after breeding. 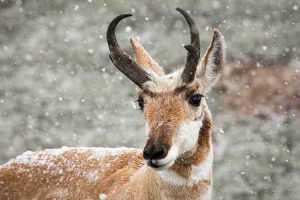 Pronghorns have hollow hair that helps to insulate them from the cold. They can survive in temperatures ranging from -50 to 130 F.
Pronghorns are herbivores that eat grass, sage, and other plants. They don't drink much water and rely on plant consumption for hydration. On average they live for 10 years. When scared, the white hair on the pronghorn's rump stands up. Groups of pronghorns are called bands or herds. All ages and sexes gather together in bands during the winter months. Bucks are territorial during the summer month. During breeding season bucks gather harems and fight other bucks. They breed at about 2 years of age in late September. Does give birth to two grayish-brown fawns after 7-8 months. Fawns can outrun a human in less than two days. Predators include cougars, wolves, bobcats, coyotes, eagles. It is legal to hunt pronghorns in Montana with the proper license and permit. Pronghorns are not members of the goat or antelope families. They have large protruding eyes that are the largest of any North American ungulate. Those eyes provide 300 degrees of vision. They can detect movement up to 4 miles away. They tend to go under obstacles, like fences, instead of over them. It is thought that there were up to 35 million Pronghorns in North America at one point. That number dropped to roughly 13,000 by 1915. Today there are roughly 800,000. 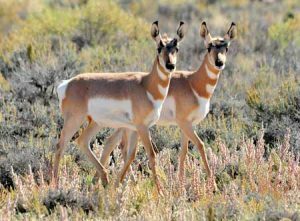 Pronghorns are beautiful creatures and you're likely to see one when you visit Yellowstone National Park or drive down I-90. Watch out for these super fast animals on your next trip to Big Sky Country. If you capture a cool wildlife photo of a pronghorn be sure to share it on social media with #visitbigsky.